During the early years of the 20th century a total of eleven virtually identical coffee houses were built to accompany the tram stops between The Hague and Wassenaar. Designed by the Scheveningen-based architect F.A. Koch, just one of these modest timber structures has survived. 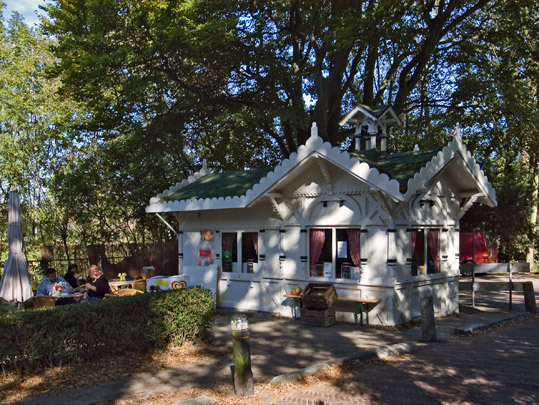 This precursor of the typical Hague coffee house stands just outside Wassenaar municipality. Exemplifying the Swiss chalet style popular around 1900, its timber framework with supporting braces is visible in the facade. The building is exquisitely decorated with wood carvings such as at the eaves and the steeple where the two roofs intersect.